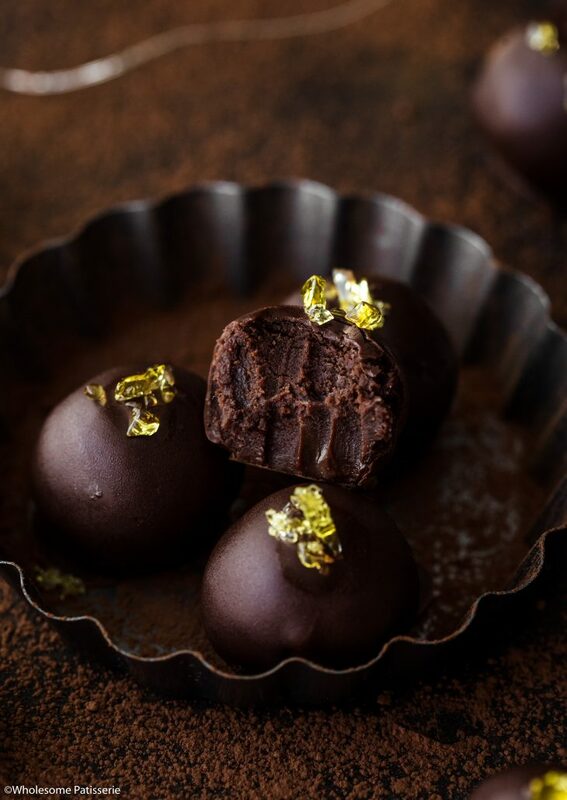 Decadence in each bite is exactly what these rum and dark chocolate truffles will offer you, amongst much more! It’s the holidays and that means we are getting prepared to make and bake our favourite festive recipes! It wouldn’t be Christmas without homemade chocolate truffles, especially the rum infused truffles! 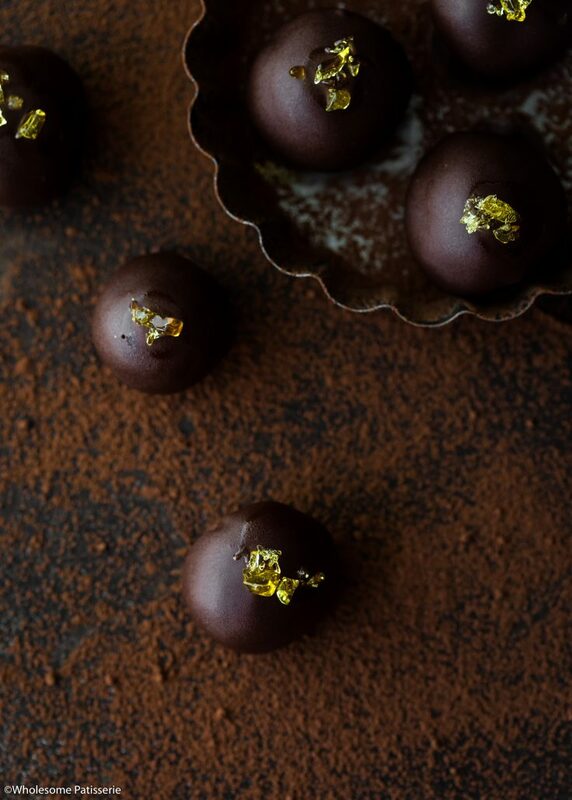 Before I get into the delicious details, the rum in this recipe can be completely omitted if you’re wanting to make an alcohol free version 🙂 You’ll have rich dark chocolate ganache truffles, yay! So let me tell you a little story behind this recipe. When I started making my Christmas recipes for this year, was a couple of months ago. 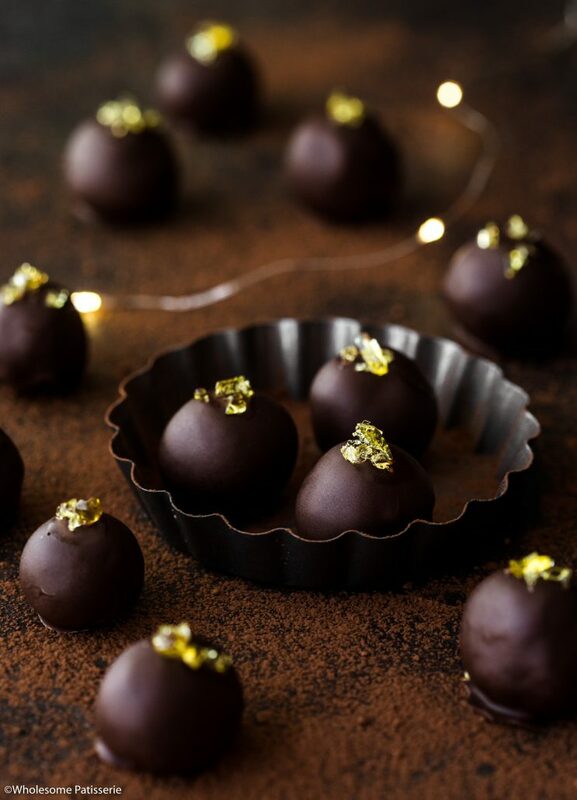 My first recipe I did were rum balls, as in biscuit based rum balls, nothing like these ganache truffles. I made and photographed them but unfortunately they missed the mark for my vision of glorious rum balls. So I let the idea go for a few weeks until I started craving the idea of sharing a rum ball recipe with you. So it occurred to me, Sam, there is such thing as ganache based balls/truffles!! I was so fixated on the biscuit based ball idea that I completely looked past the best thing ever, ganache. Which is so, so much easier to make! With less ingredients! The cherry on top? Homemade toffee shards! 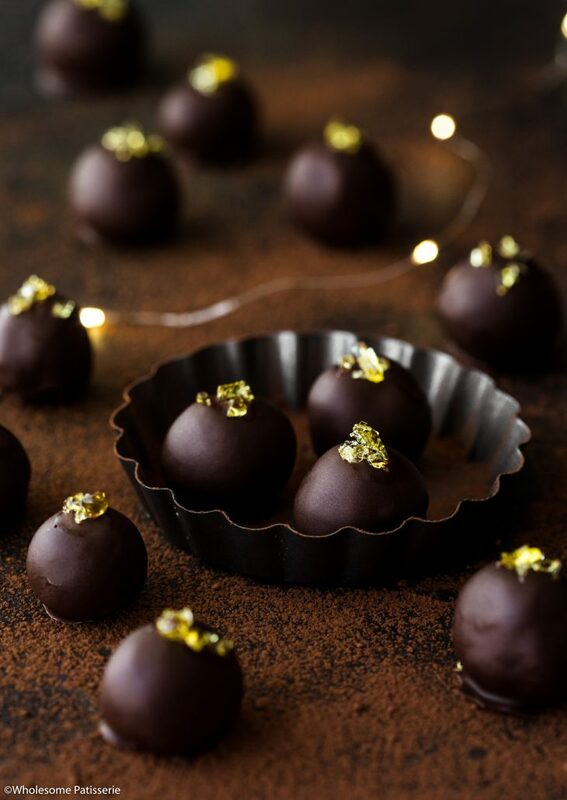 This is completely up to you if you would like to add the toffee decoration, I did as it’s the epitome of Christmas on these truffles, a touch of gold if you will. But if you don’t desire the toffee or don’t have the extra time to make it, leave it off and these rum truffles will not be bad, they’re so incredibly morish and luxurious, I hope you enjoy! Line a flat baking tray with parchment paper, set aside. Prepare and fill a small bowl with warm water and get a pastry brush ready, set these aside. In a small pot over low heat, combine sugar and water. Heat through until sugar has completely dissolved, swishing around the pot to help mix it through. Once sugar has completely dissolved, increase heat to high and bring to a boil. Take the pastry brush and water and gently brush down the sides of the saucepan to dissolve any sugar crystals around the sides of the pot, whilst the mixture is boiling. Boil mixture for 3-5 minutes or until you begin to notice it turn golden in colour. Once it has turned a light golden, remove from heat and continue to move the pot around to disperse the heat, not using any mixing utensils to do so. The residual heat in the pan will continue to cook the toffee once removed from the heat. It will begin to turn even darker, when it has turned a shade darker, carefully and slowly pour toffee onto lined tray. Move tray around to spread out the toffee slightly. NOTE: this makes a small amount of toffee so you don’t have to create a large slab of toffee. Set tray aside at room temperature until toffee hardens. Or refrigerate to fasten up the process. Once completely hard and set, take a wooden spoon and whack the toffee, it should crack. Fill a small zip-lock bag with the toffee shards and whack it some more with the wooden spoon until you achieve small toffee crumbs, perfect for decoration! Set aside. Add chopped chocolate into a large heat-proof mixing bowl, set aside. Pour thickened cream into a small pot and place over a low-medium heat. Heat through until warm and steam begins to come off the surface, do not let it come to a boil. Remove cream from heat and pour over chopped chocolate. Let it sit for a couple of minutes and then mix well, until the chocolate has completely melted and mixture is smooth and shiny. NOTE: if the cream hasn’t fully melted your chocolate, place bowl over a double boiler and heat until completely melted. Once melted and smooth, add rum and mix until well combined. NOTE: add more or less rum if desired, or can be omitted completely. Place plastic wrap over chocolate and set in refrigerator until completely set, approx. 2-3 hours or preferably overnight. Once truffle mixture has completely set, begin to form truffles. Using a small melon baller or teaspoon, scoop a heaped tablespoon of mixture and quickly roll into a ball before it begins to soften. Place ball on lined tray and repeat with remaining mixture. Place tray in refrigerator to allow the truffles to firm up. Meanwhile, melt together chopped chocolate and coconut oil over a double boiler until completely smooth. Remove from heat. Using a fork or a chocolate dipping tool, carefully place 1 truffle into the melted chocolate until completely coated. Gently pick up truffle using fork/dipping tool, and allow excess chocolate to drip back into the bowl. Place back onto lined tray. Repeat this method with remaining truffles. 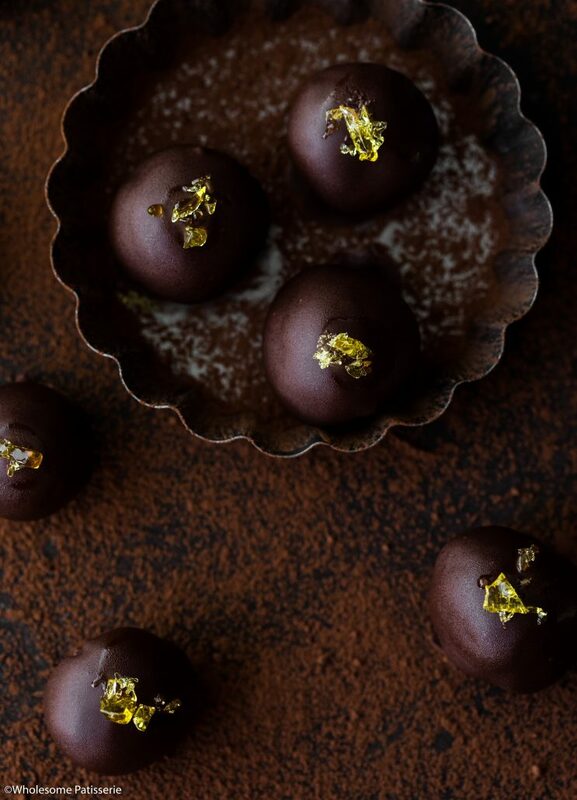 If using toffee shards to decorate, now is the time to place a little of the toffee onto the top of each truffle, before chocolate has the chance to harden. Once all coated and decorated, place tray back into the refrigerator until chocolate sets. Store truffles in an airtight container, refrigerated, for 4-6 days. The toffee will begin to soften and melt over the next couple of days, this doesn’t chance the flavour. Omit rum from the recipe for alcohol free truffles.